Sengoku Basara: Samurai Heroes, known in Japan as Sengoku Basara 3​ (戦国BASARA3, Sengoku Basara Surī? ), is a 2010 action-adventure video game developed and published by Capcom for the PlayStation 3 and Wii. 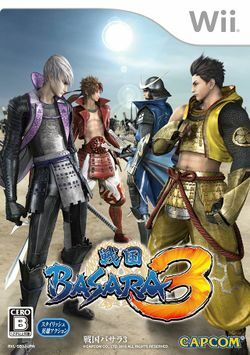 The game is the sequel to Sengoku Basara 2 and was released on July 29, 2010 in Japan. Samurai Heroes is a hack and slash combat game emphasizing large battlefields and an element of strategy. The strength of the controlled character allows for superhuman feats of destruction against multiple foes, and the battles center around defeating large amounts of enemies. Additionally, missions are completed (in general) by defeating "gate captains" and eventually a boss and/or minibosses. Samurai Heroes mixes up the gameplay by adding in other objectives as well, such as guarding a castle or destroying an enemy's food reserves. The uniqueness of each character allows for different fighting styles, such as those which focus on hitting a large number of enemies versus those which focus on a few (excellent for killing boss characters). Combos are easily performed, and characters have the ability to gain levels by completing stages, eventually unlocking skills and/or adding additional power to their existing ones. Weapon acquisition and customization is also an integral element of the game. In the Sengoku Era, Japan was torn by strife and conflict. In the Incident at Honno-ji, Mitsuhide Akechi forced Nobunaga Oda to commit suicide, and the Nobunaga Army was no more. Nobunaga's attempt to unify the lands by force of arms had failed, and now Hideyoshi Toyotomi's army would attempt the same feat. The strength of Hideyoshi's army was overwhelming, and it was not long before Hideyoshi had taken control of the entirety of Japan. But this victory did not satiate his ambition, and Hideyoshi began planning the conquest of foreign lands. But Ieyasu Tokugawa rejected these ambitions and turned against his leader Hideyoshi. After a long and vicious confrontation, Ieyasu defeated Hideyoshi. Two periods came to an end, and once again the lands descended into chaos. On the one hand, there is Ieyasu Tokugawa, determined to unify Japan using the bonds of human relationships. On the other hand, there is Mitsunari Ishida, a survivor of the dethroned Toyotomi clan obsessed with wreaking vengeance upon Ieyasu. The clash of wills between just two men will consume the entire land, and determine the path of Japan's very history! This page was last edited on 10 July 2017, at 10:57.